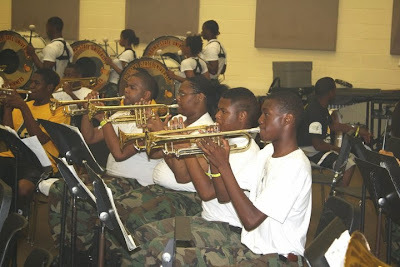 A column dedicated to the HBCU Marching Band Experience, as well as HBCU culture in general. Sponsored by the 5th Quarter, Inc. "Protecting Our History...Preserving The Craft!" I had a pretty interesting debate going with some of my friends this morning about a scenario that ANYBODY that's marched in an HBCU program has faced. WHEN do you hang up that band uniform for good? It's a question that seems pretty simple in nature, but it's one that's RARELY answered in a simple manner. In fact, it's one of the hardest things for some HBCU students to address when their time in school is done. Ideally, the average undergraduate student wants to be in school 4 years and be done. That's the standard. 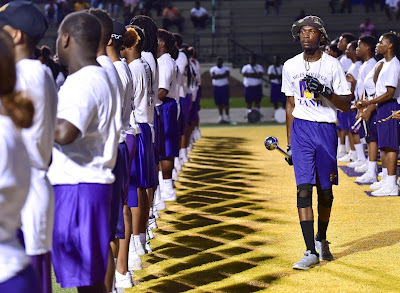 The reality varies from person to person, especially when it comes to students that are part of the sub-culture that is HBCU marching bands. For many, membership in an HBCU band program is a lifelong affair, even a generational one. The fellowship and camaraderie that a student builds through the experiences gained by membership and performance are second to none. Of course, there comes a day where the ACTIVE phase of playing in a high powered band program has to come to an end. For me, that end came when i had to make a choice between the course load I was carrying, and the time and effort that band brought to the table...Grades come first, so my marching days ended. Easy decision, isn't it? Well, for MANY bandsmen, it's not that easy. Often, those lines are blurred. Whether it's the cat that's marching (as an adult student), or the guy/gal that's marching whose enrollment IN school is dubious at best, it's a very REAL problem that faces our band programs. It's also indicative of the pressure that MANY programs are under to produce a quality product and put it on the field...Programs that DO field students that are older than the average kid have a certain stigma attached to them, fair or unfair. At the end of the day, it's on both the program AND the individual to discern when it's okay to participate and when it isn't. How old is too old? That also is a question that can only be answered by the individual whose lacing them up every day. Whether you're young, or not-so-young, the priority of ANY student matriculating at an HBCU institution is academics. As pleasant (and in some cases addictive) as our craft is, it will ALWAYS take a back seat to the academic responsibility of being a student at an HBCU. If you'e in that 5th year of an unplanned 6 year degree plan, you're priority SHOULDN'T be what next weeks field show is gonna look like. Welp...it's the time of year that all bandheads and fans of the craft absolutely dread, the off-season. It's that time of the year (for HBCU Bandom) where gameday experiences consists of facebook groups, smack talk, and hour after hour of YouTube footage ,or like entities(Shout out to my man Dave Norman @ BandTubeHD, the community @ BandHead.org, and the Standard by which all other HBCU Marching Band Social Media sites are measured, Christy Walker, Mike Lee @ The 5th Quarter). Even with these tools at the ready, it's hardly a replacement for those last two weeks in August when you KNOW the season is right around the corner. With that spirit in mind, let's take a quick look back at some of the more interesting moments from last season. 1) The BoomBox Classic was one for the ages...AGAIN. The Aristocrat of Bands (Tennessee State Univ.) is arguably one of the more tradition-laden and steady programs out there, but the shine they get is muted by their sports memberships (The Ohio Valley Conference doesn't really lend itself to visibility for an HBCU band program as much as traditional HBCU conferences would). 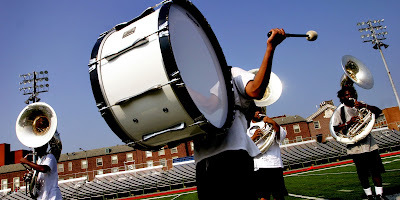 Nevertheless, the AoB was back with a vengeance this season with a large band, brandishing a polished on-field sound and their trademark encyclopedia of stand music. They were one of the most consistent on-field performers this season. 3) Talladega continues to raise eyebrows and visibility, for better or worse. I don't think there was a more...polarizing....band program than 'The Marching Tornadoes' out of Alabama. Getting noticed when you don't have a football program is the ultimate hurdle for ANY HBCU program to deal with, but Talladega has done so by hitting any and every BOTB, parade, or 3rd party exhibition they could muster. The result was a HONDA Showcase appearance, a first for the 3 year-old program. Do they get a LOT of influence from a certain band program in the Gulf Coast region? Absolutely. Could their field shows use a bit of polish? Possibly. That being said, you'd be hard pressed to find a 3-year old program with THIS type of potential...Besides, moments like this year's Fountain City Battle of the Bands Event (Talladega's multiple 'sucker' punches vs. a returning FAMU, and resulting face-off with in-state rival Miles College) are classic 'YouTube legend' material for programs like Talladega. 4) Is the State of Alabama turning into a new hotbed for HBCU Band rivalries? 5) 'Bama State Style' may just get the bad taste of Drumline out of my Mouth. Finally...We have the opportunity to purge the scourge of Devin Miles (and the lame sequel) from our collective memory banks. Lifetime is now home for the first reality series based on what we do in the craft. So far, 'Bama State Style' has lived up to the billing. No Atlanta A&T, no Petey Pablo in endangered fur coats; Just a good representation of what a Black College Marching Band is all about. As an MMH Alum, it's a proud moment for myself, as well as anybody else that had the opportunity to call Tulibody Hall home for 4 years. It's also great to see a new generation of Marching Hornets navigate their way through the HBCU landscape like we did long ago. Needless to say, I'm chomping at the bit for the 2015-16 season to get here. Pretty soon we'll be seeing oceans of white tees, combat boots, and green freshmen experiencing their first taste of Pre-Drill. Given how the 2014-15 season progressed, This upcoming one should be something to behold. The 5th Quarter, Inc "Protecting Our History...Preserving The Craft!"